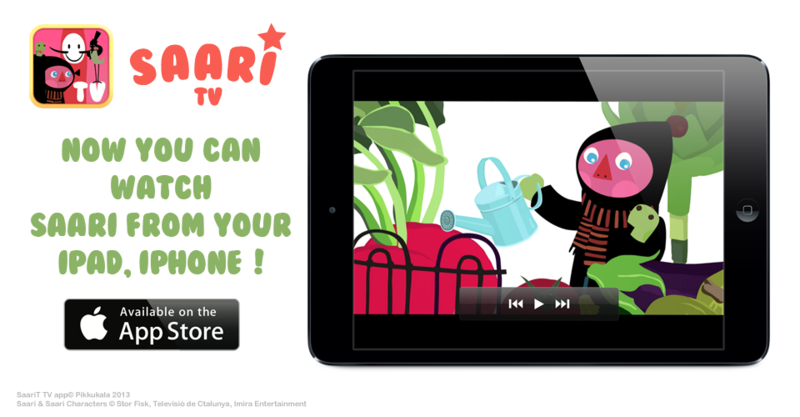 Saari TV now available on AppStore!Saari TV disponible en el AppStore! Finnish studio Pikkukala released today “Saari TV”. This new app will allow parents and animation enthusiasts to watch free episodes of animated series Saari and optionally purchase episode packs to access them anywhere including offline. Download it from the AppStore and let us know what you think! http://pikkukala.com/blog/wp-content/uploads/2013/05/Saari_TVslider_pikkukal.png 500 960 Pablo Jordi http://pikkukala.com/blog/wp-content/uploads/2015/01/logoheader_small.png Pablo Jordi2013-05-19 09:08:032013-05-19 09:10:59Saari TV now available on AppStore!Saari TV disponible en el AppStore!